A Soviet-era ballistic missile shot out of an underground silo in southern Russia and rocketed into orbit Thursday (Nov. 21) with 32 satellites for students, corporations and government agencies from 18 countries on five continents. The launch from a remote military facility in southern Russia came barely one day after a U.S. Air Force Minotaur 1 rocket blasted off from NASA's Wallops Flight Facility in Virginia with a record-setting 29 satellites for the Defense Department, NASA and university and high school students. The Dnepr rocket was ejected from a silo by a black powder cartridge at 0710:11 GMT (2:10:11 a.m. EST). The dramatic launching procedure used by the Dnepr rocket is unique among space launchers. The Dnepr is a modified Ukrainian missile known as the R-36M, also called the SS-18 in Western circles. After vaulting out of its underground container, the Dnepr rocket fired its engine while suspended in mid-air, then accelerated away from the Dombarovsky missile base near Yasny, Russia. The 111-foot-tall rocket soared into space a few minutes later, shedding two stages before its upper stage flipped around and flew backwards, firing thrusters to reach the velocity required for the mission's target sun-synchronous orbit 373 miles in altitude. Mounted on adapters and inside deployment pods, 23 of the rocket's passengers jettisoned from the Dnepr launcher's third stage at approximately 0725 GMT (2:25 a.m. EST), according to officials involved in the mission. Nine more payloads are subsatellites that launched inside larger spacecraft for deployment later. 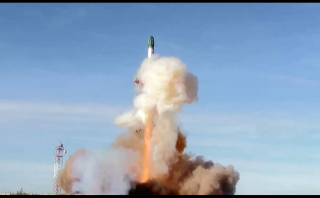 Thursday's launch was managed by Kosmotras, a Moscow-based company with joint Russian-Ukrainian ownership that oversees the commercial exploitation of the Dnepr rocket. Kosmotras called the mission a "cluster" launch, inking deals with satellite operators and companies specializing in arranging launch opportunities for CubeSats, which are often built by institutions with limited experience in the space business. "All payloads have been inserted into their target orbits," Kosmotras said in a statement on its website. One of the payloads was DubaiSat 2, an Earth observation satellite about the size of a compact car jointly developed by Satrec Initiative of South Korea and the Emirates Institution for Advanced Science and Technology, or EIAST, an entity of the Dubai government. DubaiSat 2's camera will capture imagery of Earth's surface with a top resolution of 1 meter, or 3.3 feet, according to the EIAST website.The Dubai government will use the imagery for environmental projects, urban planning, infrastructure, telecommunications and electricity projects. According to EIAST's website, DubaiSat 2 imagery can also be commercialized. A satellite built and operated by Skybox Imaging of California was also sent into orbit by the Dnepr rocket. Named SkySat 1, the oven-sized spacecraft is the first of 24 satellites planned by the start-up company, which intends to offer high-resolution imagery with rapid refresh to provide customers with more up-to-date views of cities, farms and industrial sites. South Korea's STSAT 3 multipurpose satellite was launched with instruments to observe the Milky Way galaxy in infrared and monitor Earth's environment, particularly water pollution, according to the Korea Aerospace Research Institute's website. The 375-pound spacecraft also has an engineering mission to test out new satellite technologies in orbit. And an Italian-built satellite named UniSat 5 serves as a mothership for eight other spacecraft, which will pop out of the host satellite later in its mission. Four of UniSat 5's subsatellites are tiny devices dubbed PocketQubes just 2 inches in diameter. The PocketQube is a miniaturized version of a CubeSat, a type of small satellite model that has revolutionized access to space for small companies, universities and developing countries. CubeSats are already minuscule - its basic unit is about the size of the palm of a hand - but PocketQubes are sized even smaller. A Peruvian CubeSat to be released from UniSat 5 will spawn its own daughter satellite with a mass of just 100 grams, or about the same as medium tomato. Other payloads launched Thursday include a toaster-sized Polish satellite to monitor the variability of bright stars, a pair of U.S.-built asset tracking satellites, a 22-pound Japanese craft to track changes in polar ice, and a swarm of CubeSats dedicated to educational pursuits, technical demonstrations and amateur radio.